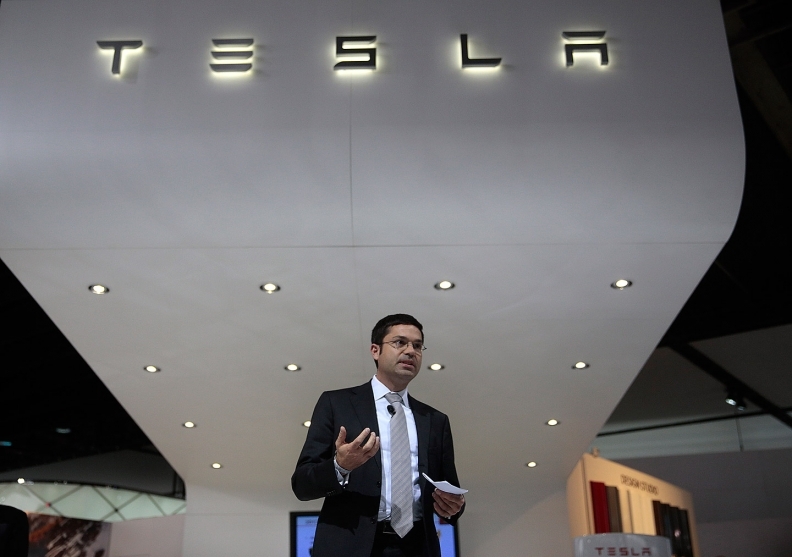 Jerome Guillen, then vice president of worldwide sales and service for Tesla, at the Detroit auto show in Jan. 2014. He is returning to a customer-satisfaction role. SAN FRANCISCO -- Tesla Motors Inc. is looking to hire executives to run sales operations in Asia, North America and Europe as it seeks to rapidly increase deliveries. Jerome Guillen, vice president of global sales and service, will return to a customer-satisfaction role. After missing its sales goals last year because of production issues, Tesla is aiming to boost deliveries by 74 percent in 2015. It's struggled to gain traction in China as sales slid in California. The fast-growing company is also building the world's largest battery factory, creating an energy-storage division and introducing its first SUV. "Jerome has not been demoted in any way," Tesla said in a statement. "He has been and remains part of the senior executive team, reporting directly to Elon." On the company's website, Guillen is still listed as vice president of worldwide sales and service, a position he took on less than two years ago. Tesla said it's interviewing candidates for the three leaders to manage regional store and sales-force operations. "Once they are on board, Jerome's focus will be on post- sales activity from delivery to long-term customer care, where he has done an incredible job," Tesla said. "He has taken Tesla to the highest service satisfaction of any company in the auto industry by far." Tesla plans to deliver 55,000 cars this year up from the 31,655 sold in 2014. The automaker said about 1,400 deliveries slipped from December to the first quarter due to shipping problems, winter weather and customers' holiday travel. Guillen, who has a Ph.D. in mechanical engineering from the University of Michigan and previously worked at Daimler AG, was promoted to vice president of worldwide sales and service in April 2013. "Jerome started off as the Model S program manager and we had some real problems with our service capability," Musk said during remarks at the World Energy Innovation Forum, held at Tesla's Fremont, Calif., factory, last spring. "I asked Jerome to switch from being program manager to running service. He did a great job. I asked him if he could do sales too. If people have the right attitude and are smart, they can do a lot of things." While Tesla has entered new markets and almost doubled in size to 10,161 employees in 2014 from 5,859 a year earlier, its sales operation has struggled to keep pace. Some Model S customers who took ownership of their cars before the "D" version was announced last fall cried foul about missing out on the new features, such as all-wheel drive and driver assistance capabilities. About 55 percent of Tesla's 2014 deliveries were in North America, 30 percent in Europe and 15 percent in the Asia-Pacific region, Tesla said in its recent letter to shareholders. The company had said it expects vehicle sales to ultimately be evenly divided among the three regions. The sales operations have faced challenges in key markets. Sales in California, historically Tesla's strongest market, fell 27 percent last year to 6,110 cars, according to data from the California New Car Dealers Association. And Tesla recently cut staff in China, where research from JL Warren Capital shows that just 2,500 Model S sedans were registered last year. Musk has blamed his Chinese sales team for the sluggish sales. "The biggest issue which we're still fighting to address is this perception that it is difficult to charge your car in China," Musk said during last month's earnings call with analysts. "This is false. It is not difficult to charge your car in China. Unfortunately, this sounds kind of brain-dead, but our sales team was telling people that it was difficult to charge in China, even though this is not true. That's pretty silly."